A recent Frost & Sullivan report has indicated that more and more industries are cutting back on their internal dimensional inspection resources because of limited funds and a lack of skilled technicians. The most viable solutions for many companies it to outsource this valuable service to third-party providers like Q-Plus Labs. When it comes to dimensional inspection, the more accuracy you have, the better the outcome will be. In many cases, this means applying different measurement techniques for different applications. The same equipment and technology will not be used to measure both automobile parts, medical devices, and the sharpness of an instrument. By the same token, a diverse staff of trained professionals is required to provide dimensional inspection services across multiple categories. Risk management - Testing products or components before they enter the manufacturing process helps you reduce overall risk and liability. You can identify and solve problems before they become costly, or even worse, disastrous. Whether you are testing the roundness of a precision bearing or the curvature of the interior thread root of a bolt, accurate measurements can mean the difference between failure and success. More effective decision making - Sometimes a process or product that looks good on paper does not seem like such a good idea when it becomes a reality. Advance measurements can help you make key decisions during the development process, before it's too late to make changes. Ability to determine process capability - If the end product requires high levels of pressure, force, shear, or any other extreme environment, validating a process or equipment with a capability study before it is subjected to these conditions can save your business a lot of time and money. In fact, any products that will be going into high-volume production should have a capability study as part of process control. Regulatory compliance - Depending on your industry, you may need to meet certain regulatory requirements. Validating these requirements before submitting to an audit is the best way to ensure that you are compliant. Q-Plus Labs has the equipment, technology, and knowledge to provide the dimensional inspection services you need for your products. Whether you need to analyze large contours, measure dimensions at the nano level, or perform a specialized non-contact inspection, we have the necessary resources to provide accurate, unbiased results in whatever format you require. Contact us or download one of our many product and services brochures to learn more about dimensional inspection and the many other services Q-Plus Labs offers. 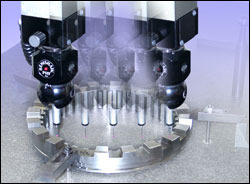 How has dimensional inspection benefited your business in the past?